lil lostman........i LOVE that truck. Last edited by creamsicle68; 10-23-2009 at 07:12 PM. Now that`s a set of headers that`ll clear the clutch linkage. That shot at the dunes is a classic magazine shot,if you ask me.Paddles and all. yeah lol. mine has a turbo 350 but clearance was one of the main reasons i built them. 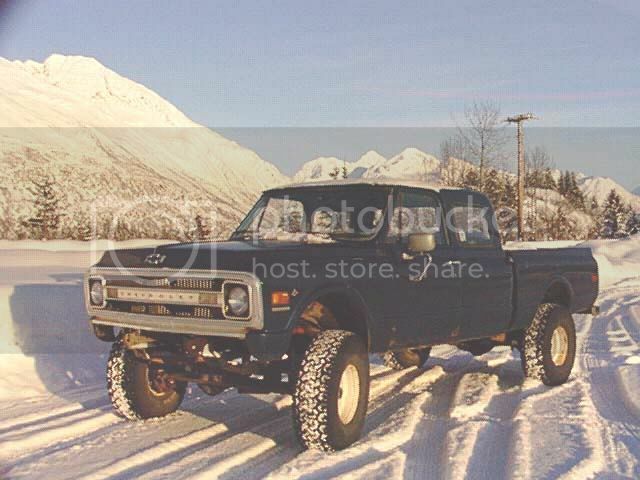 Last edited by 1970 chev truck; 10-24-2009 at 07:24 PM. Reason: Forgot Picture!! 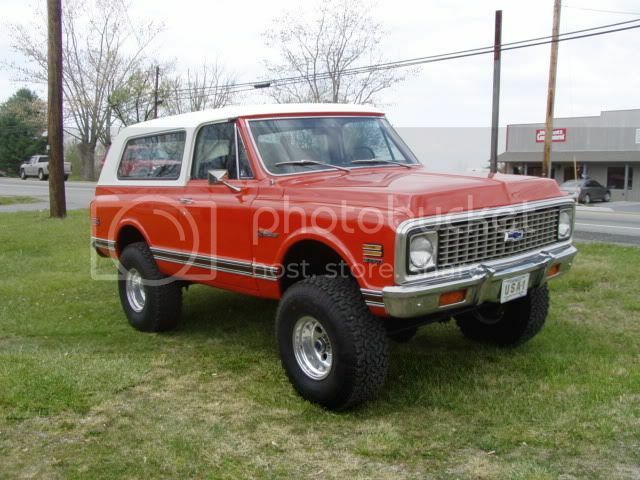 Here is my 71 4x4 1/2 ton fresh out of the body shop last weekend. That "view is beautifull" but your Blazer is the icing on the cake! Nice truck! My truck in posed shots. And stuck 2 wheel drive cant tell but rear bumpers touching ground. THe other truck, wheeler 69 1/2 4x4, yellow and rusty. Last edited by special-K; 10-27-2009 at 10:13 AM. 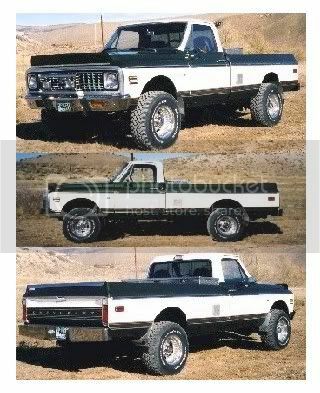 all nice trucks. 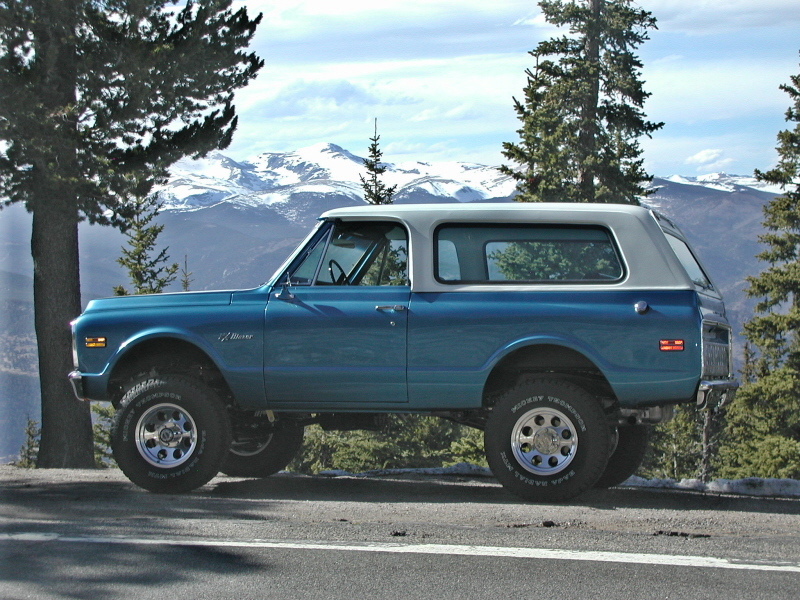 I am trying to find links to 4x4 conversions. I need to see pics of the front end. How the front springs are mounted. Don't mind the body mount, the will fix later in time, but not high on my list. CRoss member, with motor mount brackets, or customs fab if up, you can use the 2wd and makes a plate from the frame to bracket and bracket to bracket. I tried just welding frame to bracket each side the weld broke, tig welded. Yes the exhast is welded right there, a muffler shop did it, don't know why but they did, And i don't really care. Edit i was going to take a pic of a 67-72 chevy truck that was at the dunes, a nice one clean from where i was at, but seemed the motor was lackng somewhat sounded good, just tires didn't seem to want to move fast, He was trying to throw sand. Last edited by onlyifihadachevy; 10-27-2009 at 07:02 PM. 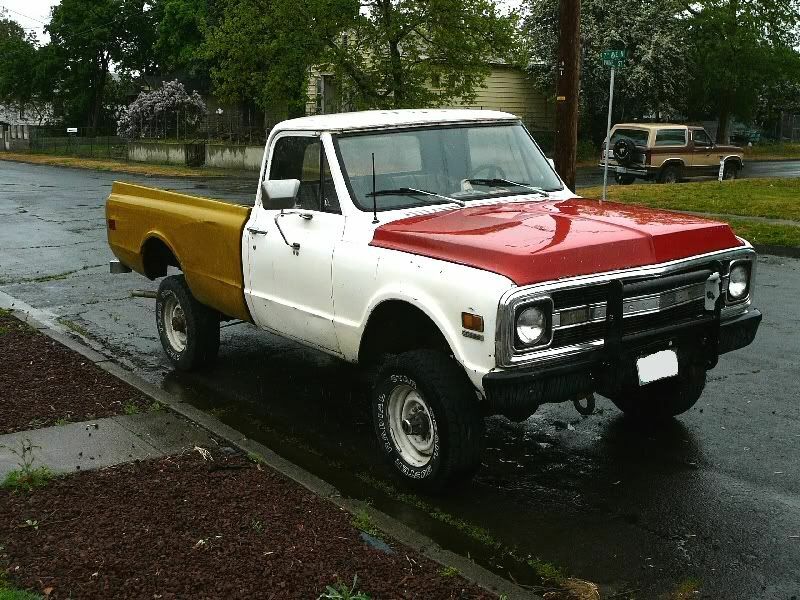 My son's(as long as he behaves LOL) 72, numbers matching,1 owner,no rust, 114,000 miles, 350/350. nice truck your son has there!!! 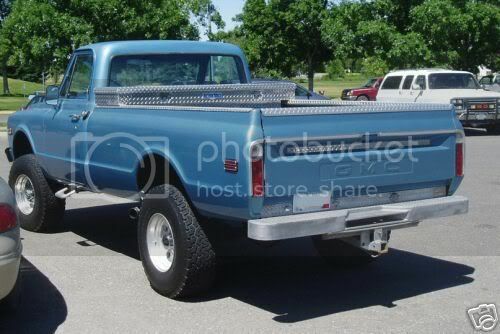 that's the exact truck in the exact color I'm hoping to build! how much/what type of lift is on the truck? Strange Cousin From The West..
Well, I just got mine so there are only the before pics so far. We plan a full frame off restore with some lift and more tires under it but as time goes on I hope too share some good progress pictures. thanks for looking. Nice to find a SWB K/10.Have fun with it.I see a diamond in the rough.